The best-known brewer of export stout was Thrale’s Anchor Brewery in the parish [district] of Southwark, a mile or two up river from the Courage site. In 1796 Thrale’s supplied porter "that would keep seven years" to the Empress of Russia. The author of The History and Antiquities of the Parish of St. Saviour, Southwark, said of Thrale’s beer at that time, "The reputation and enjoyment of Porter is by no means confined to England. As proof of the truth of this assertion, this house exports annually very large quantities; so far extended are its commercial connections that Thrale’s Entire [a contemporary name for porter] is well known, as a delicious beverage, from the frozen regions of Russia to the burning sands of Bengal and Sumatra. The Empress of All Russia is indeed so partial to Porter that she has ordered repeatedly very large quantities for her own drinking and that of her court." 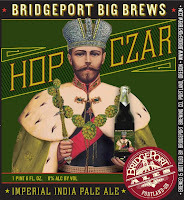 So with Hop Czar, BridgePort brings a little history and perspective to the nouveau style of imperial IPAs. If the beer's anywhere near as good as the label is cool, we're in for a treat.